Click above to download a 21 page extract. 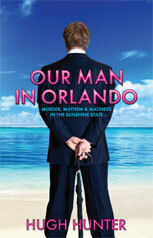 Hugh Hunter thought he’d landed his dream job as Our Man in Orlando – The Queen’s Representative in sun-soaked Florida. After all, Orlando is the No1 destination for British holidaymakers – who wouldn’t want to be paid to spend his life on the sun-soaked sands of America’s most popular vacation state? But he soon found out it wasn’t quite like that – and life in charge of Britain’s Consular Office in the teeming Disneyworld city turned into a nightmare. The beaches, nightclubs and resorts in his new home were swarming with Britons, but not all of them were there for a good time. From Day One, his working week was an endless round of prison visits to meet British murderers, drug dealers and conmen – desperate people with terrifying tales to tell. Most of these stories never made it back home – until now, when they’re told with humour, pace and candour by Hunter.